PEARL HARBOR, Hawaii – This will be their last visit to this watery grave to share stories, exchange smiles, find peace and salute their fallen friends. This, they say, will be their final farewell. With their number quickly dwindling, survivors of Pearl Harbor will gather Thursday one last time to honor those killed by the Japanese 65 years ago, and to mark a date that lives in infamy. "This will be one to remember," said Mal Middlesworth, president of the Pearl Harbor Survivors Association. "It's going to be something that we'll cherish forever." The survivors have met here every five years for four decades, but they're now in their 80s or 90s and are not counting on a 70th reunion. They have made every effort to report for one final roll call. Nearly 500 survivors from across the nation were expected to make the trip to Hawaii, bringing with them 1,300 family members, numerous wheelchairs and too many haunting memories. Memories of a shocking, two-hour aerial raid that destroyed or heavily damaged 21 ships and 320 aircraft, that killed 2,390 people and wounded 1,178 others, that plunged the United States into World War II and set in motion the events that led to atomic bombings of Hiroshima and Nagasaki. The attack may have occurred 65 years ago, but survivors say they can still hear the explosions, smell the burning flesh, taste the sea water and hear the cries. "From the time the first bomb dropped and for the next 15 minutes, it was complete chaos," Edward Chun said. "Nobody knew what was going on. Everybody was running around like a chicken with their head cut off." Chun saw the Oklahoma and West Virginia torpedoed by Japanese aircraft. He heard the tapping of sailors trapped in the hulls of sunken ships. He escaped death when Ten-Ten was strafed, leaving behind dead and wounded. Many of the dead were teenage sailors and Marines away from home for the first time. They died before they had an opportunity to get married, have children, build lives. Four in five servicemen on the USS Arizona — 1,177 in all — did not survive the day. It was the greatest loss of life of any ship in U.S. naval history. They remain entombed in the battleship's sunken hull, which still seeps oil every few seconds, leaving a colorful sheen on the harbor water. The survivors say they have more than horrific memories to offer. "Remember Pearl Harbor" is just the first half of the association's motto; the rest is "Keep America alert." Martinez said many Pearl Harbor survivors were disheartened by the September 11, 2001 terrorist attacks, "as if they had not done their job hard enough." Once again, it seemed that America had been caught sleeping. Interest in Pearl Harbor and its aging survivors surged. The old soldiers are much in demand _ to sign autographs, walk in parades, speak to classrooms and pose for pictures. Visits to the USS Arizona Memorial are at record levels. Not that everyone sees similarities between the two attacks. "There is no comparison," Hyland said. "That was terrorists killing a pile of civilians. Here, you had professional fighters versus professional fighters. Two different things." There are those who are unable to forgive the Japanese, But others testify to the power of reconciliation. "There are some guys that are going to die with hate in their heart. I don't have in me any hatred in my heart," said 87-year-old survivor Lee Soucy, of Plainview, Texas. "They were doing their job just like we were." Hyland, who was almost killed in the attack, married a woman from Japan. They met at the 50th Pearl Harbor anniversary and wed the following year. "I got over it a long time ago," he said. 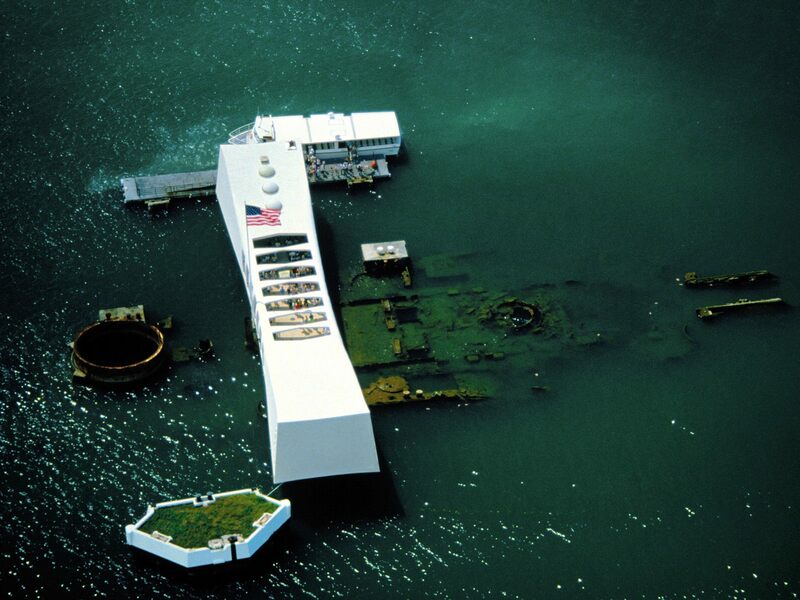 Check out the Pearl Harbor Multimedia Map and Timeline at National Geographic. Check out the article at Wikipedia. Get the historical facts surrounding Pearl Harbor at The Naval Historical Center. It's very ironic that people would keep such a infamous day close to their hearts. I do not believe that it is the horrific events of that day which are kept close to heart, but rather the loved ones who were lost and the nation's reaction to Japan's treachery. In Pearl Harbor, Japan "Awoke a Sleeping Giant." Enlistment skyrocketed and the nation united to fight and defeat the tyrants of World War 2! If not for Pearl Harbor, there's no telling how long a complacent America would have taken to mobilize its military and industrial might. Taking the Christ out of Christmas? No Blank Check for you Governor Blanco!